TOC Latin America — Being held April 20, TOC Latin America will focus on standards, global digital publishing trends, case studies of innovative publishers in Latin America, consumer habits, and much more. Take a break and "PressPausePlay"
Are you a cultural conservative? Progressive? Do you think once we get through this non-linear bit, digitally-produced culture will settle back down into a recognizable pattern? Or will this fragmentation last forever? Would that be utopian or dystopian to you (or have I just re-phrased the first question)? Did it ever make sense to have music / film / art "industries" or was that just a blip in history? What does this post contribute to your cultural signal-to-noise ratio? Kristen McLean: An agile methodology is a series of strategies for managing projects and processes that emphasize quick creative cycles, flat self-organizing working groups, the breaking down of complex tasks into smaller achievable goals, and the presumption that you don't always know what the finished product will be when you begin the process. Agile methodologies emerged out of the software development community in the 1970s, but began to really codify in the 1990s with the rise of several types of "lightweight" methods such as SCRUM, Extreme Programming, and Adaptive Software Development. These were all rolled up under the umbrella of agile in 2001, when a group of developers came together to create the Manifesto for Agile Software Development, which set the core principles for this type of working philosophy. Since then, agile has been applied outside of software development to many different kinds of systems management. Most promote development, teamwork, collaboration, and process adaptability throughout the life-cycle of the project. At the end of the day, it's about getting something out there that we can test and learn from. Kristen McLean: In relation to publishing, we're really talking about two things: agile content development and agile workflow. Agile content development is the idea that we may be able to apply these methodologies to creating content in a very different way than we are traditionally used to. This could mean anything from serialized book content to frequent releases of digital content, like book-related websites, apps, games and more. The discussion of how agile might be applied to traditional book content is just beginning, and I think there's an open-ended question about how it might intersect with the deeply personal — and not always quick — process of writing a book. I don't believe some of our greatest works could have been written in an agile framework (think Hemingway, Roth, or Franzen), but I also believe agile might lend itself to certain kinds of book content, like serial fiction (romance, YA, mystery) and some kinds of non-fiction. The real question has to do with what exactly a "book" is and understanding the leading edge between knowing your audience and crowdsourcing your material. Publishing houses have been inherently hierarchical because they've been organized around a manufacturing process wherein a book's creation has been treated as though it's on an assembly line. The publisher and editor have typically been the arbiters of content, and as a whole, publishers have not really cultivated a direct relationship with end users. Publishers make. Users buy/read/share, etc. Never, ever Only if you've tried everything else is it okay to give your crying baby a shot of vodka. While some regard this kind of formatting as overly cutesy, it serves a genuine editorial purpose: either slyly injecting a bit of humor or, for accuracy-minded folks, publicly preserving the revision trail. In a digital book, with just a bit more special sauce added (namely, animation), a live view of such changes could serve a similar role — one that might add an entertaining bit of dynamism to the writing. In the hands of the right author, the creative possibilities are intriguing. Early passages in a novel could be presented anew to the reader, updated in front of them to incorporate new information. Characters could shine a spotlight on previous exchanges and "edit” or comment on what they said, or what they wanted to say. It'd be like having the ability to re-do a fight with your spouse. Okay, maybe that one's better left imagined. But that's why we've got books! So we can read about crazy people and gauge how closely, or not, they resemble us. I've run across one example recently where the writer — a video game reviewer — used the effect to underscore the iterative story that awaits anyone who plays "Infinity Blade". You can watch the page in action by visiting it yourself, or get a quick taste by checking out this screencast I recorded. 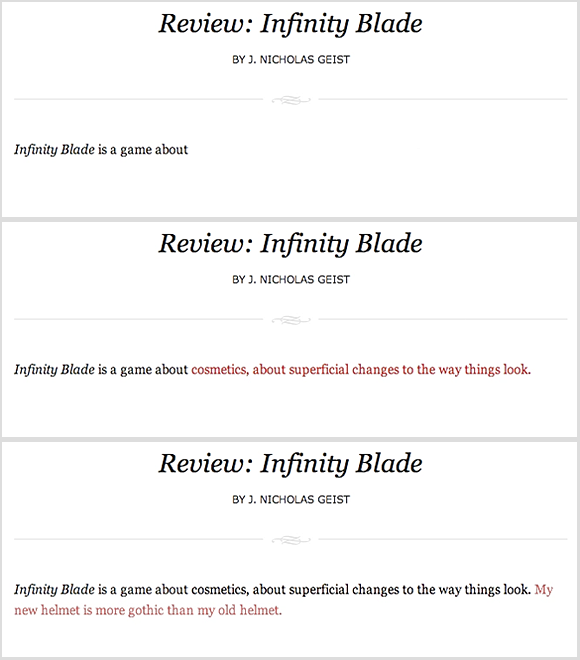 In a bit of meta commentary, this video game review shows the iterative nature of the game "Infinity Blade" by altering the review text. And here's a similar example, created by "Hobo Lobo of Hamelin" author named, um, well, @MrHoatzin is the shy guy's Twitter handle. He's an incredibly talented cartoonist who used the effect in the "Technical Considerations” section of his website. As always, I'm on the hunt for other examples that use this kind of not-possible-in-print maneuver in a reader-friendly way. Let me know — I'm at peter dot meyers at gmail dot com — if you've seen anything worth checking out. Webcast: Digital Bookmaking Tools Roundup — Pete Meyers looks at the growing number of digital book tools: what's best, what's easiest to use, and what's worth putting in your book-building toolkit. You can view Barcott's book trailer here. For a more detailed look into the business behind the book trailer, I turned to Brett Cohen, vice president of Quirk Books. This is the company behind "Pride and Prejudice and Zombies" and a publisher that's produced a fair number of book trailers. Brett Cohen: It varies depending on the book's audience. Certainly, it appeals to an online demographic. And, the viral nature of a YouTube video is working at its best when others share it with their friends via Facebook or Twitter, or post it on their blogs. Some of our viewers watch the trailers embedded onto other sites, like the Huffington Post, Techland and io9. That type of syndication expands the audience for the trailer and the book. Our most-viewed trailers have definitely appealed to a younger, pop-culture-driven audience. Brett Cohen: For us, a good book trailer speaks "the language" of our target audience. Our Quirk Classics book trailers mimic the production value of big-budget movies, with exceptional special effects. We've created other trailers for humor books that are more irreverent. For non-fiction titles, we've taken a more author-driven, information-based approach. Overall, we feel that it's very important to be true to the book so that it can translate into sales. Brett Cohen: We've worked with a few different production companies and have had great experiences with them all. Amazon named our "Sense and Sensibility and Sea Monsters" book trailer as the best book trailer of 2009 — and essentially launched the "big budget" movie-style book trailer trend. That video was created by Ransom Riggs and has been viewed more than 290,000 times. Our "Dawn of the Dreadfuls" trailer was created by Dirty Robber and has had more than 250,000 views. This past fall we worked with Epic Image Entertainment on our "Night of the Living Trekkies" book trailer, which has more than 160,000 views. Ultimately, though, we want it to help sell books in the same way that a book review or advertisement can drive sales. While that is tougher to track, we have been able to see trends. We do see an early spike when the trailer launches, particularly in online sales. And the trailer stays on our channel forever, so, frequently, a new site will embed the trailer at a later date and we'll see another bump. At the heart of this though, is the fact that publishers create content — in Quirk's case, it's entertaining content. And if we can entertain a viewer through the medium of video, ideally it will encourage them to check out our books. Flux.net : We recently premiered your new music video for “Open Your Heart” with the original song that you wrote. It is so vivid and the level of craft that went into that piece is impressive. Can you share how was it working with Michel Gondry on this project? What were some of the challenges and was it a fulfilling collaboration and one you would do again? Mia Doi Todd : Making the “Open Your Heart” video was epic. Michel had had the color concept of the video for many years but hadn’t managed to realize it yet. He proposed the idea to me, and I took up the challenge to write a new song that would be vibrant, upbeat and universal to match the visual palette. I wrote “Open Your Heart” and recorded a demo version with Money Mark. Meanwhile, Michel had assembled a rainbow of clothing and along with a great costume team, we sewed all the 100 outfits for the video. I designed and sewed my own dress. Michel and I went out location scouting around my neighborhood, looking for unassuming urban settings with interesting or else very mundane architectural elements. We knew that concrete surroundings would show off the colors of the costumes, and we wanted to find staircases where we could assemble our rainbow. LA is such a driving city, that the landscape is often out of human proportion and gets lost in the rush. The video would bring the human element back to those spaces. I have lived in LA most of my life, and its images are deeply imprinted in me. It was a great opportunity to share with Michel some of the hidden city. The days for shooting were quickly approaching, and we did not have a final version of the song. We decided to go ahead with the shooting schedule and make a new challenge for Jon Brion. He would produce and orchestrate the track after the video was edited and customize the sounds and arrangements to the images. // not new, I know, but really worth to have once more a look in it.